Roll over a text box and click to personalise. You can change your colours and illustrations through the drop down menus below. You will receive a checked and revised digital proof of your order within one business day. You can then amend your design before sending to print. 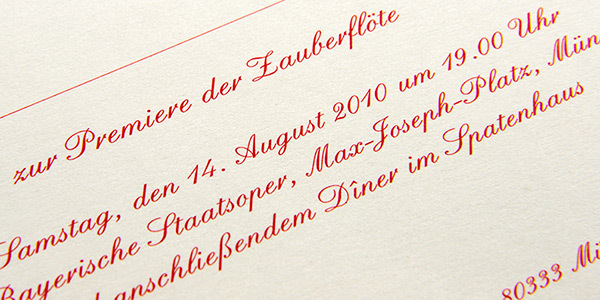 These personalised colourful Wedding Invitations with keyline border are created with Prantl's 200 years of experience. Your superior bespoke cards are are delivered in our signature Prantl boxes. 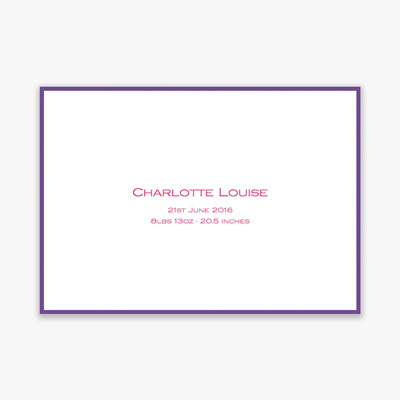 You can personalise your stationery to your individual requirements using our online configurator. When ordering from a smartphone or tablet, you only need to choose your paper, the quantity, and printed envelopes if needed. We will contact you regarding your individual personalisation. You will receive your proof (as a PDF) within one working day, which can be amended as many times as you please. We will never print anything without your print approval. 1. Choose your preferred quantity. 2. Choose your preferred paper or card. 3. 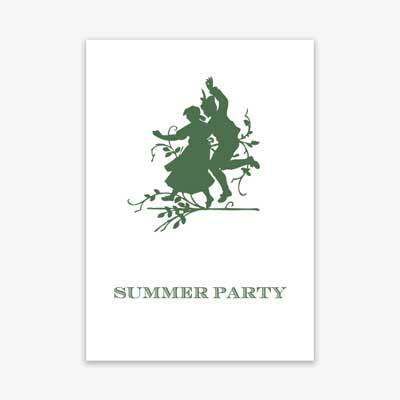 If your stationery includes envelopes, choose if you would like these printed on (surcharge of €95) or not. 4. Let us know of any comments or alterations that you might have (i.e. use of own logo). 5. Click on EDIT DESIGN to configure your product or to change an already configured product. 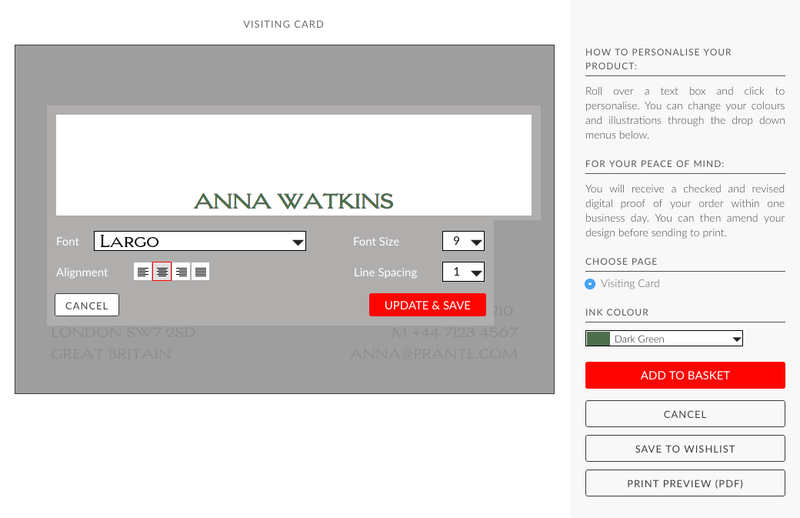 In the pop-up window that opens, on the right hand side you can choose the individual pages of the product, the print colour(s) and a motive, if applicable. In the actual product window, you can click on the different text blocks and change the text inside. You can also change the font, the size and the spacing of the text. Clicking on ‘Save Text box’ will save your changes. Some products offer the possibility to upload a photo. Please bear in mind that the quality of the photo needs to be high resolution for printing, and should be at least 300 dpi. We will check your photos and will let you know should there be a problem with your photo. Once you have finished configuring your product, you can save it by either clicking on ADD TO WISHLIST and continue to edit it later, or click on ADD TO BASKET. Clicking on CANCEL will result in the loss of your configuration. 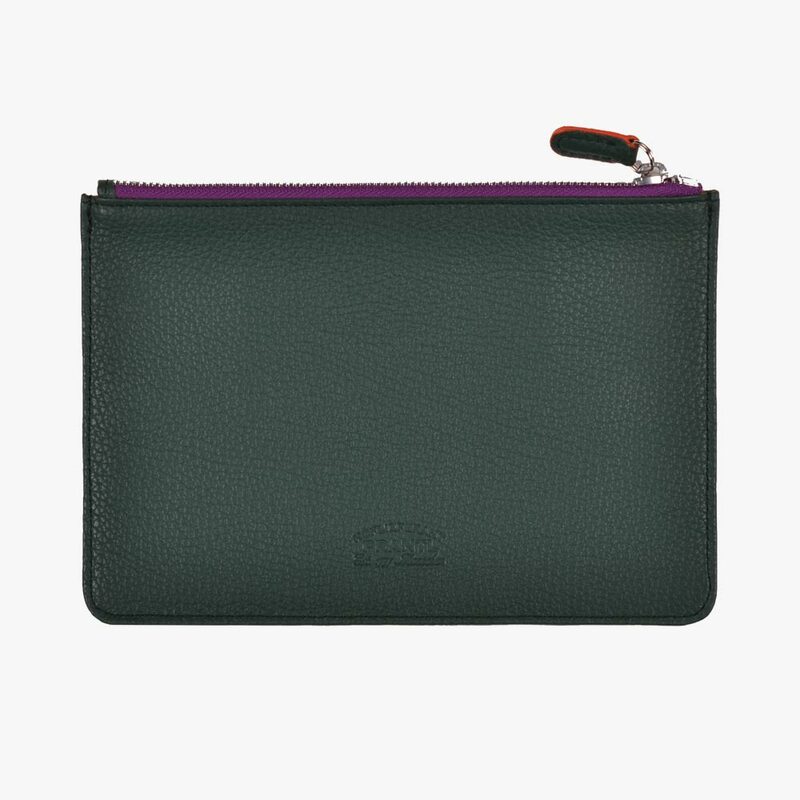 You can edit your product from the Wishlist at a later stage, or save it and edit and order it later. For all our flat printed products, we use either offset lithography or digital printing. Offset lithography is mostly used for single colour stationery which can be procured in larger quantities, such as business cards, correspondence cards, writing paper and envelopes. Lithography is based on the chemical principle that oil and water repel one another. Lithographic plates have an ink -receptive coating which is activated only on the image area. To prevent ink from invading the non-image area these areas are coated with water. The image is transferred from the inked plate to a rubber blanket and it is the blanket,rather than the plate, that comes into contact with the paper and actually prints the image. the image offsets from plate to blanket, the offsets again from blanket to paper.It is for this reason that the technique is sometimes simply referred to as 'offset printing'. For digital printing we use only high-quality Indigo Printing presses. Unlike the offset print, there are no films and no printing plates made. The printing press is directly connected to our Graphic computers, which feeds the final image to the press. Digital print is a 4 colour printing method and is especially suited for smaller quantities (less than 100), as well as multicoloured products. 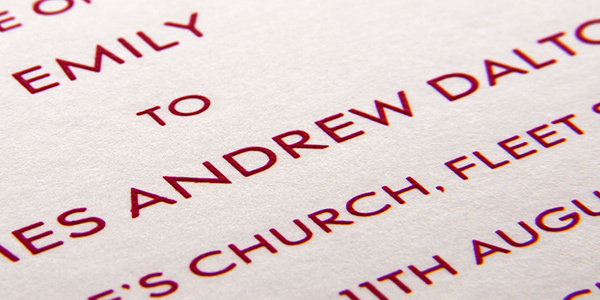 The fascination of engraved stationery lies in the creation of the individual printing tool, the die or the plate. To create an engraved print an image has first to be engraved onto a steel plate. This can be achieved by etching the design or by hand tooling it but in both cases the image is cut into the plate, rather than raised above the plate surface as in letterpress. Once the plate has been engraved its surface is inked and then wiped clean leaving the engravings full of ink. The press then forces paper into the inked recesses and thereby transfers the image onto the surface of the paper by creating an impression. The image is raised from the surface of the paper perceptibly to both the eye and to the touch. The area immediately behind the image carries some bruising and feels slightly indented and this indicates to the discerning viewer that the item has been engraved. 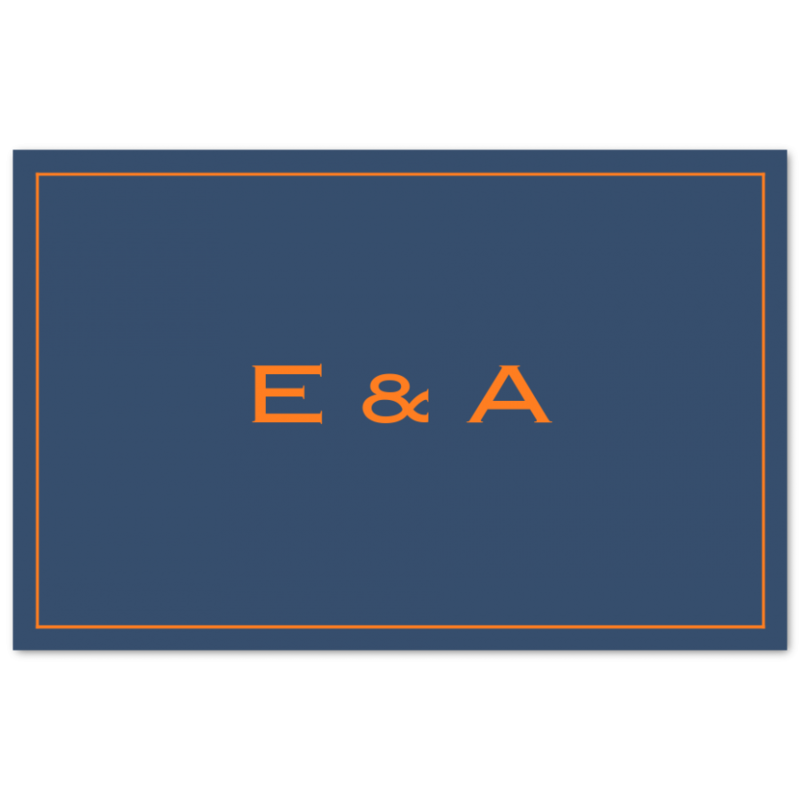 In our online shop, steel plates/dies are allowed to contain a maximum of 100 characters and no logos or graphic designs. If you require more characters or other designs, please contact our Munich store. 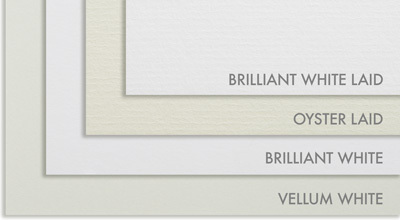 We offer a range of fine paper and cards for your personal stationery. 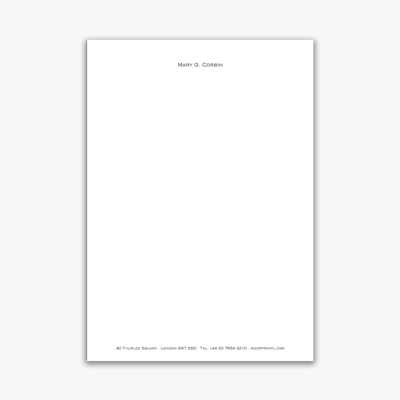 Our Brilliant White and Vellum White paper are both excellent quality writing sheets and cards which offer both good opacity and a reassuring stiffness. We offer our papers in different weights ranging from 260gsm up to 430gsm (litho only). 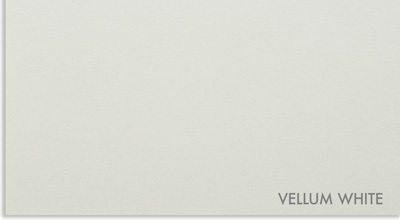 Dependent on weight and light-reflection our Vellum White papers can vary slightly in colour shade dependent on its weight. 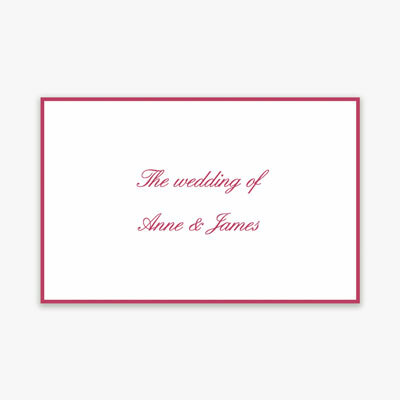 The matching Brilliant White and Vellum White card is ideally suited for use as a correspondence card and for invitations. 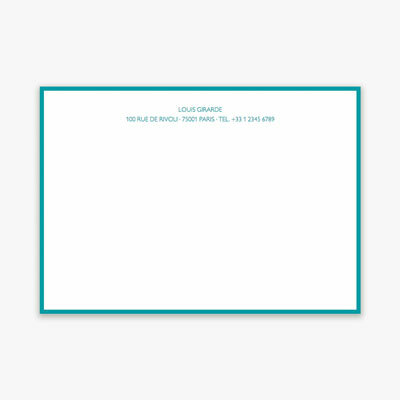 Both cards offer a smooth surface with superior writing characteristics and a reassuring "snap". Please note that colourful stationery retains its original colour where there is no print. The back of a card is therefor perfectly suited for handwritten additions. As with all colourful stationery, we recommend using a fine silver, gold or white permanent marker. You can see the weight of your stationery including envelopes in the Postal Charges section. 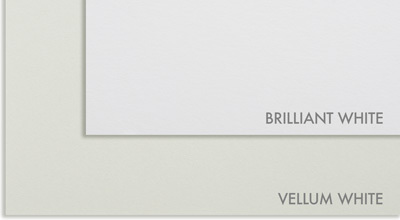 Shown below are our ink colours, in addition to black, from which you can choose. 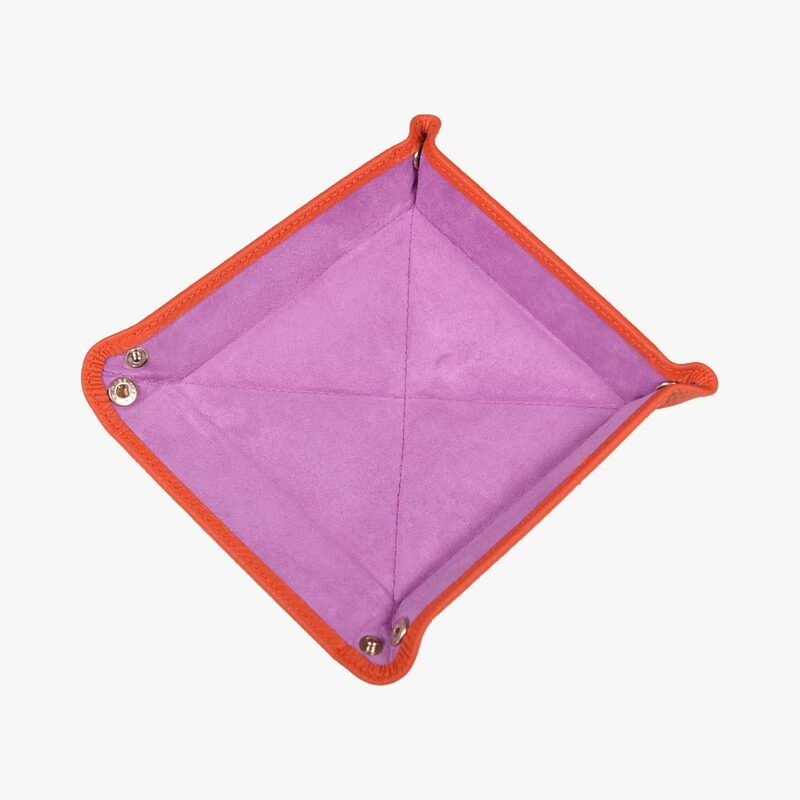 With most of our bespoke stationery you can choose any of these colours, but for some items we have reduced the choice to the optimal selection. All our ink colours are compatible with laser and inkjet printers. The colours shown below are purely indicative, as computer screens are not able to depict these accurately. The strength of the colour will vary with your choice of typeface, as finer and shaded typefaces will appear lighter than solid ones. This page shows a selection of our classic typefaces, which you can use for in the design of your personal stationery. Please be aware that the following typefaces are only available as capital letters: Chevalier, Chevalier Open, Copperplate, Engravers, Largo. These typefaces can can be displayed as characters of a uniform size or as larger followed by smaller capital letters. 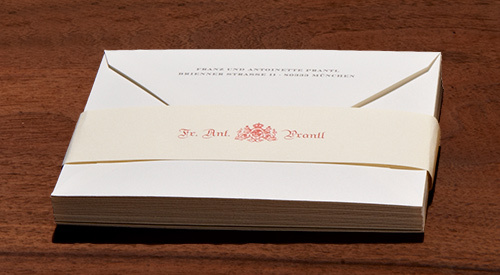 At Prantl, we separate the purchase of envelopes from cards, so as to be able to offer you a broader selection. 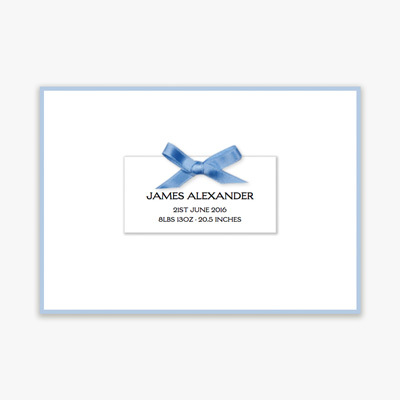 After you have configured your cards or letterheads and clicked "Add to Cart" you will be sent to a new page where you will be offered a selection of plain and printed envelopes. You can always return to this page from the shopping cart by clicking "Envelopes & More". Our envelopes all have a classic flap and either a white or grey tissue lining. During the Bavarian summer school holidays the production times can be marginally longer. 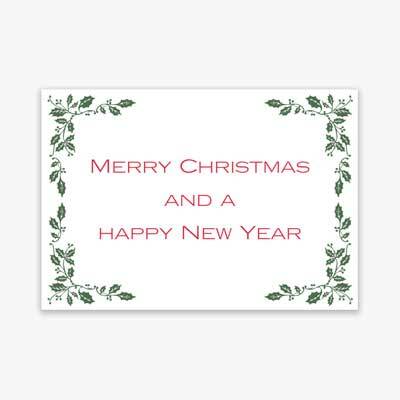 Our printing office is closed between the 24th December and 6th January. Any orders that reach us during this time will be processed from 7th January. All our stationery will be delivered in one of our handmade red signature boxes. 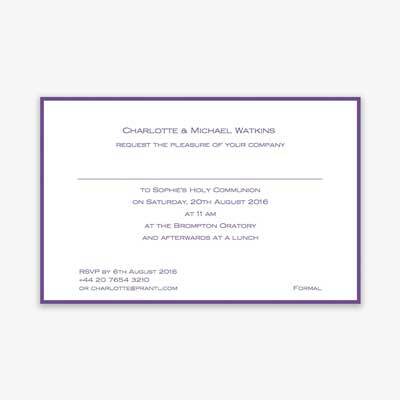 Please bear in mind that we also offer special format stationery like square cards and folded cards. Prantl AG cannot be made liable for the accuracy of this information.